Here’s the skinny on what’s in the Book: Brilliance. Hang on, this is supposed to be an unbiased summary. Let me start over. 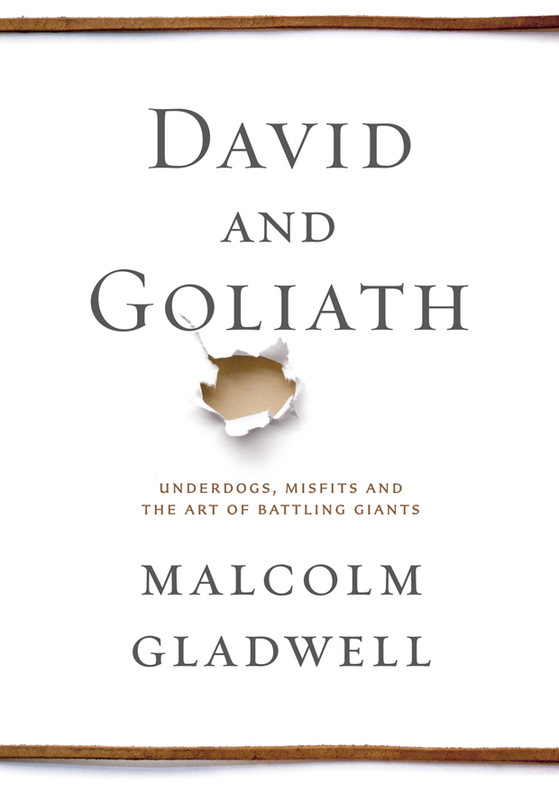 In this soon to be sermon-plagiarized book, Gladwell takes the Epic tale of David and Goliath and uses it as an entry point into a re-imagining of our bias against disadvantage and obstacle. He delves into the psychology behind the reason that those who are in the middle and bottom-third of Harvard’s Economics School publish about the same, on average, as students at that level at far less prestigious schools. He looks at the reason behind the fact that a disproportionate percentage of top performing CEOs and innovators have dyslexia. He even tackles the problems created by California’s three-strike law. He does all of this by exploring the story of people involved in each of these unique and perplexing situations. Those stories are divided into three parts that represent the three main concepts he is putting forward: The advantages of disadvantages (and the reverse), desirable disability, and limits of power. The advantages of disadvantages explores the question of why we are so surprised when the underdog wins. It happens all the time. David beating Goliath is one of many similar stories we all can tell. It turns out that being smaller, having less money, or being less skilled is not necessarily a disadvantage. Often those things end up giving the apparently weak an advantage over the strong. In part two, “Desirable Difficulties”, Gladwell makes the argument that the skills people develop to compensate for significant difficulties (like dyslexia) often end up being powerful tools that enable them to accomplish more than the average person who did not have to overcome that difficulty. While no one who had overcome whatever it was would ever desire someone else to have their difficulty, having it is what allowed them to be who they are, and in that sense is desirable. The final part explores the limits of power. By that Gladwell means that there is a point at which any system of power begins to see dramatically diminishing returns to the point of working against the powerful. At some point more power becomes a disadvantage. He comes to the conclusion that the powerful are never as powerful as they seem nor the weak as weak. And, in many situations the surprising advantages of those who are initially seen as weak ensure their ultimate success. I am sure you can tell where I fall on the sentiment scale in regards to this book. Malcolm Gladwell is an incredible author that consistently turns out interesting works that both intrigue and surprise by tying together interesting research from disparate fields into a cohesive argument. But the brilliance of this work is setting this entire story within the Biblical narrative even starting each part with Bible verses. In fact, you may never read an exegesis of the David and Goliath story as good as the one in the first chapter, which alone is worth the price of the book. However the insight into the human psyche and systems of success make this a must read for everyone, especially Christians.